Foucault and Criminology: An Introduction provides an introduction to Michel Foucault, written from the perspective of criminology’s engagement with his work. Foucault’s writing has become a central reference in theoretical and sociological criminology generally and, more specifically, in what Jock Young has called ‘control theory’. 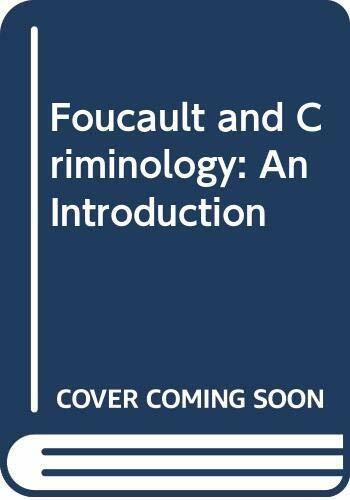 The main purpose of this book is to offer a better, clearer and deeper understanding of ongoing criminological debates to both undergraduate and research students in criminology by outlining the theoretical framework which criminologists have taken from Foucault. Its second purpose is to trace the evolution of Foucault’s political project and to counterpose the thrust of his elaborations to the more pedestrian applications of his critical analyses of the present in the field of criminology. In these respects, Foucault and Criminology offers a 'map' to guide students and practitioners of criminology: both through Foucault's own writings and those of contemporary criminologists whose work may be characterised as Foucauldian. In so doing, it also pursues the argument that Foucault’s historical and theoretical analyses of discipline, power and governance must be understood in the context of his overall project if criminologists are to avoid reducing Foucault’s radicality, and to reclaim the critical, and resistive, potential of his work. Veronique Voruz is a Lecturer in Law at the University of Leicester.